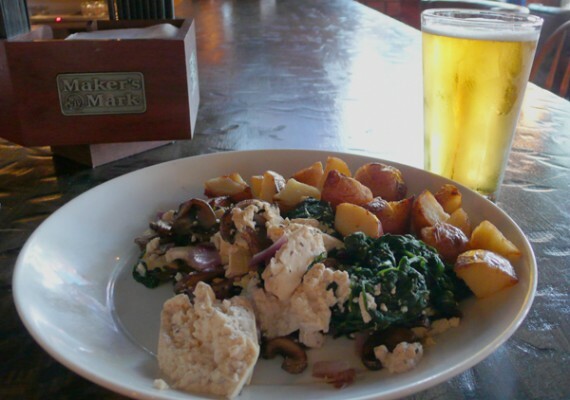 a gastropub in los angeles with 25 impressive beers on tap and a delicious vegan option? yep, it’s true. if you wanna get your drink (craftsman-style in my case) and enjoy a two-course vegan brunch, look no further than boho in hollywood. boho has been open for less than a year, but their beer selection has already made them one of my favorite bars in town. other than blue palms and the verdugo, i can’t think of anywhere with such a great beer selection. plus unlike the two joints i just mentioned, boho has awesome hours and decent parking (they are in the same complex as the archlight theatre, and they validate!). the rotating beer list that always boasts several international selections would keep me going back time and time again…but as an added bonus, boho also has a vegan option on their sunday brunch menu. while their one vegan item is merely a tofu scramble, it’s a damn good one…and even better when you consider the fact you can eat it while sipping on imported beer for a reasonable price in the heart of hollywood.